Curtain Carriers are often referred to by a wide range of terms including curtain glide, curtain glider, curtain slide, curtain slider, curtain trolly, and even a do-hickey or thing-a-ma-jig. We've had customers even call not knowing what to call them other than the things the roll or slide back and forth on the curtain track or curtain rail. Regardless of what the curtain carriers are called, they typically fall into one of three categories: wheeled curtain carriers, friction curtain carriers, or master carriers. We will provide a bit of insight into the purpose and pros and cons of each. Wheeled Curtain Carriers: Wheeled carriers are designed with wheels to roll on or in a track. These carriers either have wheels the extend on the outside of the carrier if they are designed to run inside of a curtain track, or wheel oriented inward if they are designed to run on an I Beam type curtain track. 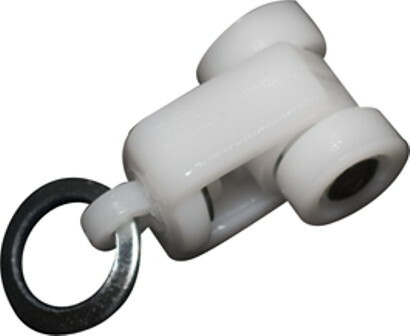 The wheels on these carriers are mounted on an axle of some sort, and may also have ball bearings inside the wheel to facilitate ease of movement. Wheeled curtain carriers usually offer the best east of movement versus friction carriers, since they roll along the track instead of slide across a track. 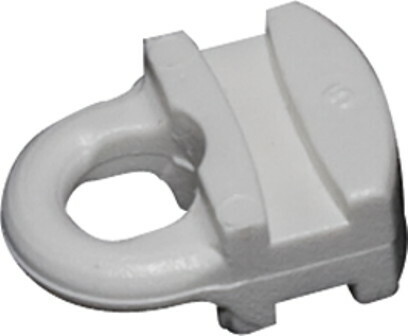 A drawback to wheeled carriers are that they may not offer the same durability as friction carriers in certain situations (particularly in damp environments like outdoor curtains) where the ball bearings have a tendency to rust. Wheeled carriers are also typically more expensive. 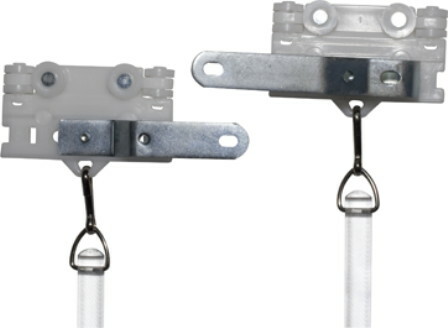 Friction Curtain Carriers: These carriers are designed with a head the slips into a curtain track or a slot that fits over an I Beam curtain track. They are usually a single piece of molded nylon or other plastic. Because of their design, they must slide across a track instead of rolling. As you may guess based on their name, the laws of physics and friction require more force to move these carriers under the same load as a wheeled curtain carrier. However, these carriers can be more durable than their counterparts with wheels, and can be perfectly fine on smaller curtains where the range of motion is limited, while also offering a lower price point. Master Carriers: These are larger curtain carriers that are used on the leading edge of curtains. When used in a pair, they force two curtain panels coming together to overlap, improving the curtains' ability to block light an afford privacy by eliminating a gap between the two curtains where they meet. Master Carriers also offer a sturdy attachment point if a baton or wand is desired to help draw the curtain panels open or closed. Because a baton is attached at the top of the curtain, the curtain is more easily drawn in parallel with the track, versus applying force at an angle when pulling on the curtain itself to draw the curtain. Plus, by using a curtain baton, it reduces the hand prints and wear that can occur on a hand drawn curtain. Master carriers actually come in both wheeled and friction carrier designs, depending on the style of the track they are to be used with. Master carriers have also be used as a more sturdy connection point when curtain tracks are used to hang things other than curtains (e.g. displays in a retail store window). The metal arms of some master carriers can be removed or flipped to better meet the user's needs. Selecting the right curtain carrier really depends on a combination of the track style preferred, the location and size of the application, and they project budget. If you have a question or need advice on curtain carrier selection, the Curtain-Tracks.com staff is here to help. 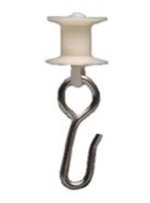 And don't forget the hooks! I am looking for the Silent Gliss carrier/roller #6098 (for the 5200 track system). Unfortunately, we do not have the carrier you are seeking for the 5200/5300 series electrical curtain track system. We are investigating sourcing these parts from Europe to meet the needs of the Silent Gliss customers here in the US.